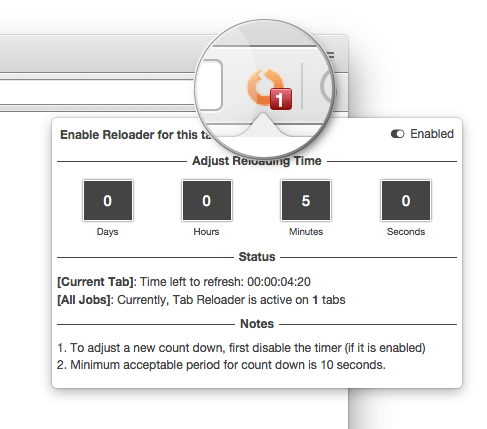 "Tab Reloader" lets you reload each browser tab with a custom time-frame. Tab Reloader supports Chrome, Opera and Firefox browsers. The extension offers different reloading options such as random time generation and supports session restore. What is Tab Reloader extension? Tab Reloader extension is design to provide full customization on how each browser tab gets reloaded. The extension can be used to update tabs to freshen their content. Is it possible to change the toolbar placement of the Tab Reloader extension? Yes, if you have Tab Reloader on Firefox, read this blog post to learn more about how to customize the position of Tab Reloader. How can I setup a new reloading job? Simply switch to the tab you would like to be reload periodically. Now open the toolbar panel/popup. If the toolbar icon is not gray, it means the tab already has a reloading job. You need to cancel the job first before assigning a new job. Now adjust the period in the "Adjust Reloading Time" section and press "enable" button. At this point, the color of toolbar button as well as the counter both will change. Also there is a count down timer in the "Status" section of the toolbar panel/popup. What is the meaning of the badge number? The badge number indicates the number of active reloading tabs. If you close a tab with a reloading job, the counter decrements by one. Do I need to disable a reloading job before closing a tab? No, if you are done with a tab with reloading job, you can simply hit the close button to close the tab. The extension monitors tabs, and the toolbar counter will adjust itself when a new job is added or removed. Is there a minimum time period for tab reloading? Currently, the minimum acceptable time period is 10 seconds. This might be changed in the future to make sure the count down starts after tab's is fully loaded to prevent unnecessary reloads. Are the countdowns persistent across browser sessions? As of version 0.1.2, the extension stores up to 20 URLs for cross-session restoring of countdowns. Please note that there are several limitations with the restoring method. First, URL matching technique is used to restore tabs as all tab related identifications are session based. So assuming you have two identical tabs with different countdowns, after a reboot the most recent countdown will be used for both tabs. Also note that if a tab was active before a reboot, it will be activated after a restart as long as the URL still matches the old one. Are there any exceptions for tab reloading after a reboot? Yes, system URLs (chrome://, resource://, and about:) are not restore-able. Meaning there would be no countdown for these kind of tabs after a restart. Is it possible to clear the stored URL list to prevent cross-session tab reloading? By default this extension remembers up to 20 reloading jobs to restore them after a reboot or a crash. If this is not your preference, go to the options page and uncheck the option. You can press the "Reset" button to clear the current history as well. I need to reload many tabs upon start-up. It is really hard to define a reloading job for each tab. Can I do this in batch? Yes. Go to the options page and define a JSON string like this example. Tab Reloader will match all the tabs with the hostnames that are defined in the JSON string and if a tab matches, an automatic job is set for this particular hostname. You can add as many hostnames as you like. In this example, all tabs with matching hostname of "www.google.com" will be reloaded every 1 minute and all tabs with matching hostname of "www.bing.com" will be reloaded every 1 minute and 30 seconds. What is the meaning of "Use cache when reloading"? If this option is disabled, the extension forces the browser to refresh the tab without using resources from local cache (all images, scripts, ...) will be fetched from the server (similar to Shift + F5). If the option is enabled, the extension uses browser cache to reload resources (similar to F5).